Hey, Babes! 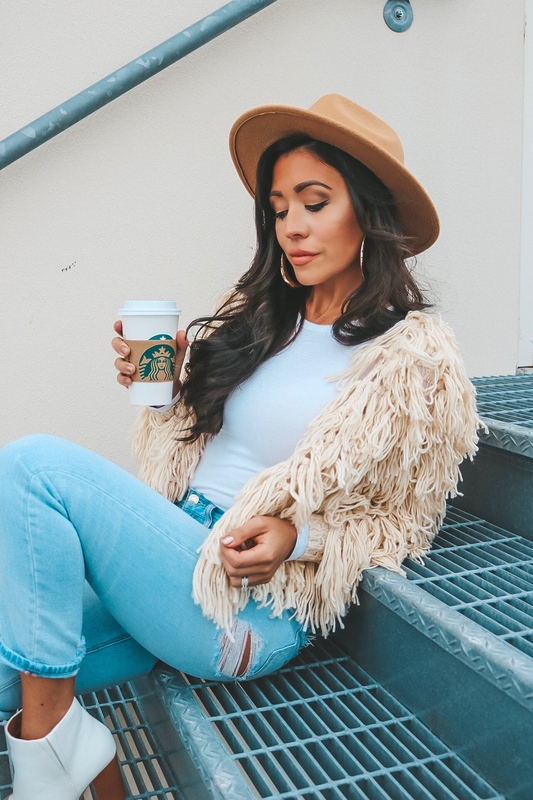 I am talking all about statement cardigans & jackets today, specifically this one I found for $40! I shared it on my Instagram Stories (@nickyschmaderer_fit) a few weeks ago and created a poll to ask if I should get it or not. At first site, it looks like a mop in the beige color but I simply loved it anyway! Well about 56% of those who responded to the poll told me to not get it buttttttt I got it anyway. I love it way too much and that price was perfect! I do listen to my audience, don’t get me wrong, but I think if you initially love it from the start it is meant to be :). I bought a size Small but I am thinking I should have went with a Medium. It is a little short in the back, so I wish it was a little longer. I still love it regardless! I paired it with an all-white bodysuit and I love how fresh it all looks put together. My hat is from Lulu’s but it is currently sold out. Similar are linked below and all under $50! Nothing like an Americano while shooting in the cold…Omaha got so cold so fast and I am not happy about it! It was 50’s and raining all weekend. I would be lying if I said the weather didn’t mess with my mood! Let’s just hope and pray we can keep that snow away for as long as possible! I scored these amazing booties from Charlotte Russe a few weeks ago but they are currently sold out. 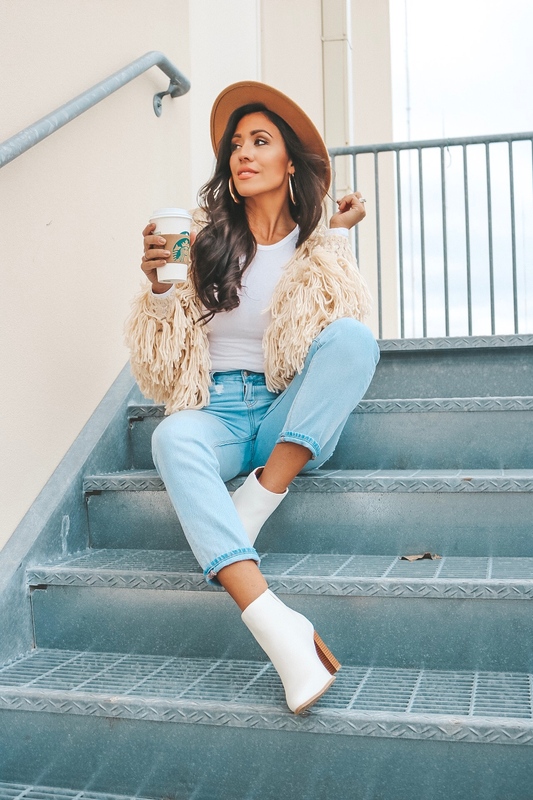 I have linked below similar white booties I am loving! I will probably be purchasing a few more pairs ;). I hope you all have a great week! Brody and I are celebrating our 4th wedding anniversary Thursday (insane!). I am taking off work early to have lunch with him at his school. We both work the day of and his football schedule keeps him there pretty late at night so we make the best of it! I guess thats what you call getting older…but we will definitely go out solo in the near future. 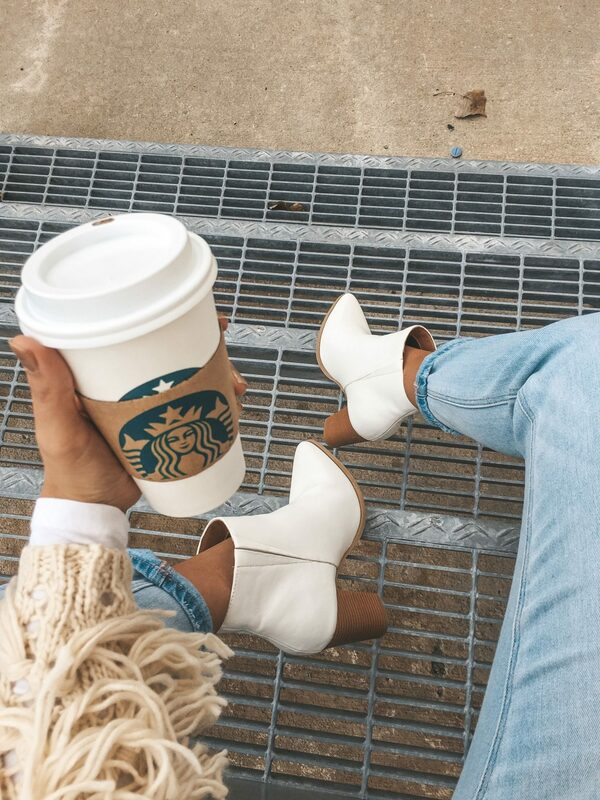 Cheers to the week, babes!